Recorded in many spellings including Henman, Hensman, Hinchman, Hincksman, Hinckesman, Hinxman and possibly others, this is an English medieval surname. It is or was descriptive for a knight's groom or page and derives from the pre 7th Century word "hengest", meaning a stallion. An act of Parliament passed in the year 1463 to restrain excess's in dress by the public, makes an exception in favour of "Hensmen, Heroldes, Purceyvantes, Swerdeberers, as Maires, Messagers and Minstrelles". The following entry is found in the Privy Purse Expenses of 1532: "Item, the same daye paied to the yoman of the henxman for their lodging at ii tymes at Westminster". Early recordings of the surname include: Thomas Hengysman, mentioned in 1460, in the Index of Wills proved in the Rochester Consistory Court; John Hengestman, recorded in 1473, in documents published by the Suffolk Institute of Archaeology; and Thomas Hincksman, who appears in the register of St. Dionis Backchurch, London, in 1674. Joseph Hinxman, was christened on March 30th 1729, at St. Botolph without Aldgate, London. 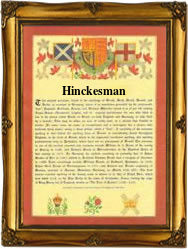 The first recorded spelling of the family name is possibly that of William Henxman. This was dated 1413, in the London Close Rolls, during the reign of King Henry Vth, known as "The Victor of Agincourt", 1413 - 1422. Surnames became necessary when governments introduced personal taxation. In England this was sometimes known as Poll Tax. Throughout the centuries, surnames in every country have continued to "develop" often leading to astonishing variants of the original spelling.